I monitor disk space closely on my computer using various built-in tools like Windows Explorer but also third-party programs such as WizTree or the recently reviewed GetFoldersize. Whenever I notice a sharp decline in free space I investigate the matter to find out more about it. While that is sometimes easy to answer, for instance after installation of a large program on the system, it is surprising at other times. When I analyzed the space distribution of a PC's main 128 Gigabyte Solid State Drive today, I noticed a 3 Gigabyte File System folder in the Chromium directory that I never noticed before. Side Note: This was not the first time Chrome was using lots of disk space. The location on the computer running Windows 7 Professional was C:\Users\Martin\AppData\Local\Chromium\User Data\Default\File System, and the name of the 3 Gigabyte file was 00000000. Chrome (and Chromium) use the folder to store files stored with the help of the File System API which is part of HTML5. While I cannot remember interacting with a web service that dropped a 3 Gigabyte file on my system while using Chromium, it appears that is exactly what happened. The files are obfuscated but not protected in any other way which means that you can open them in programs supporting them. These files may be deleted right in Windows Explorer or another file manager but you may also use Chrome's "Clear browsing data" dialog to do so. Load the chrome://settings/ page in the Chrome browser. Search for clear at the top. Click on the "clear browsing data" button when the results are displayed. 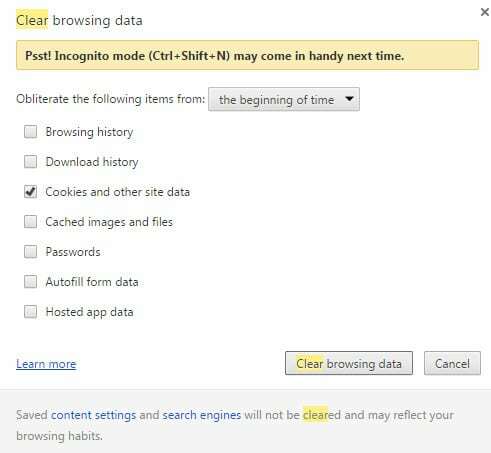 Make sure "cookies and other site data" is selected. Please note that this will remove cookies from the browser which will log you out of any service you are currently signed in and may also remove web settings from Chrome. CCleaner users may want to download and add the latest Winapp2.ini file to the application which includes an option to clear Chrome's FileSystem folder when you run cleanup operations. Chrome's Developer Tools ship with options to enable FileSystem viewing. The feature is not enabled by default though and limited to the domain you are on. Hit F12 while Chrome is open to load the Developer Tools window. A click on the wheel icon in the top right corner opens the settings. Select experiments on the left and enable "FileSystem inspection" there. Once you have enabled the option under Experiments, it becomes available as an entry in the Developer Tools. Tap F12 on the site that you want to explore the FileSystem storage of. Select Resources > FileSystem to display persisent and temporary storage entries. Browse these to find out more about the files stored by the service on your local system. Another option is provided by the Chrome extension HTML5 FileSystem Explorer. Its biggest drawback is that it works only on the site you are on meaning that you need to know which site dropped files on your system to investigate the matter. While it may reveal additional information about the files, it won't reveal file names as well. You do get options however to clear the stored data using the extension. Now You: How big is your FileSystem storage folder? The guide explains what Chrome's File System folder is, what it is used for, and how to clear it to free up disk space on the local machine. This is one of several reasons I dumped Chrome and went back to Firefox. Chrome has become all about the bloat. It was taking up (on my system) over 1GB of memory with only a handful of tabs open. It keeps prior versions of itself in a folder on the C drive. It adds 4 or 5 items to system startup. it tries to stay running when closed (some silly bell icon in the systray). It bloats its cache, it bloats this file system folder. Many programs have little or no respect for smaller SSD drives and take up crazy amounts of space needlessly (relative to what the app is for). there is no way a web browser should be occupying as much space as a AAA video game! That file is present due to how mega.co.nz stores files as you download them. This functionality/process wasn’t available in Firefox (back in 2013) which is why Mega stated users needed to user Chrome. Later on, FF addressed the issue and Mega created an extension that increased the security. As I understand it, the file Martin points out is a container for the file being downloaded, and once the download is complete, the file is re-written from the container to a new, separate file. The container remains, and I don’t believe there is any vacuuming, reindexing, etc performed on it. It simply sits there and continues to grow larger, or spawn off another container file that eats up more space. If you search Google with that directory path and ‘mega’ you’ll see dozens of hits covering the same topic. The size of File System folder is : 2.58 MB. Did you ever download one of the Win10 iso’s from Mega by chance? I know there is a bug (or has been) where all of the temp files created by Mega are not deleted once the download is complete. If the last time you cleared cache was 6 years ago, of course this folder is going to be huge. I suggest clearing cache much more frequently instead of every couple of years. Please… read the article before commenting? The referenced 3.0 GB file “AppData\Local\Chromium\User Data\Default\File System” was NOT a Cache File, but stored in the “Cookies and other site data” File System. And if Chrome is like Firefox, the Cache File has a default size of 350 MB limit for the size of the Cache File, before it automatically clears the file. When my boot drive is nearly full, CCleaner is the first program I use to clear out files I don’t need. When I need to be more aggressive, I use ‘System Ninja’, which I have seen find a couple of GB more to remove. Last clean out was seven days ago. Today 830 MB. The question must be Why Does Google do this? In Chromium for OS X there is no such option “Experiments” in the Developer Tools. It list, General, Devices, Workspace and Shortcuts. I only use Chromium for Financial transactions and clear everything after each use. And, if any are interested, you can set size limit of Cache File in Firefox, but I could find no such option in Chromium. To enable “Experiments”, you will need to enable the Development Tools Experiments option. Go to chrome://flags to enable. Your browser will require a restart. This is one of the reasons I use portable browsers and have done so for several years now. Firefox Portable (pcxFirefox to be specific) being my primary browser with Chrome Portable as a backup, as well as Chromium Portable and Maxthon Portable as well for testing purposes. It’s much easier to keep track of what they do and don’t do and how much space they happen to consume at any given time because they’re all nicely packed into one single folder that I keep on the Desktop – I even run them from a RAMdisk most of the time (with backups of the RAMdisk to an image file on the hard drive every 5 minutes). I hadn’t bothered to check on the Chrome Portable size in the past month or so and I just did and it was much larger than expected (I had done a few downloads recently using it) and so a simple clear operation brought it back to the typical size (it’s still about 227MB even when it’s stripped clean of everything). Since years I always create a ramdisk with any software (usualy witt SuperSpeed software but there are many others). All browsers are set the path for cache files in such ramdisk. It gives me three advantages: no problems with such not needed files as after switching computer off all files don’t exist, it improves my privacy as there is no trace on the hard disk and the last but not least-this solution makes a browsing faster because of obvious reason-ramdisk speed is many times faster then hard disk speed. And almost forget-such cache files don’t fragment my hard (or SSD) drive. If setting a new path to a browser’s Cache folder is easy with Firefox, as far as I remember it’s far less obvious with Chrome. I recall a command-line argument when starting Chrome, has this improved since? Whoops, meant to also say, you should disable these warning completely to make it harder to bad guys to guess your file paths. Really should change it now since it was exposed to everyone. Just saying. My FF portable was 3 1/2 years old – that’s a lot of updates, tweaks, fiddling under the hood. The last update, something broke, and every single icon under customize was gone, plus a couple of other annoying minor things. Anyway, grabbed a clean portable FF, added all the extensions – 68 of them – migrated over all saved passwords, greasemonkey scripts, user styles, noscript setttings, add to search, FVD Speeddial, adblock plus settings etc, and a ton of other stuff like saved icons etc – most are easy as you can simply copy over select files such as permissions.sqlite, places.sqlite, stylish.sqlite (or folders such as “FVD Toolbar”, “gm_scripts” etrc) – or you can export and import them (bookmarks, requestpolicy, foxclocks etc – or you can copypasta the settings/whitelists from about:config (eg UAControl, RefControl). The worst part was going through and changing all the privacy tweaks, but I had over the course of the last year or so compiled a list of them in Scrapbook X – you know, all those about:config changes like beacons, hello, pocket, reader, urls for updates, yada yada [NOTE to martin, we need an updated list]. And of course I tested each extension worked as I added it and configured it. All up, took me about 8 hours with some of that time taken to read some news for mini breaks. No doubt a couple of things I missed. I guess over the years, the old FF had extensions come and go being tested etc, changed out – and ended up full of leftovers or something. So whats in that 3GB? My file system folder is 3.05GB. 2.9GB is made up of 24 files titled 00000000 to 00000023. Even numbered files are just 1KB. Odd number files are either 8MB+- or 430-450MB. Odd number files has gibberish text with a bit of xml in the middle. I prefer Firefox over Chrome. Less hidden trick files in system directories. Are you doing to amend this article per eskaton’s information? Altough this probably already spread to the blogosphere, so good job. I recently bought a new very fast pc. After 2 or 3 months I suddenly discovered that the 1 terabyte hard drive was completely full. Investigation showed that the file history option had been set by the supplier, and every file was being backed up every 10 minutes. I soon changed the settings!! The size of my folder “C:\Users\%user%\AppData\Local\Chromium\User Data\Default\File System” is 8,7 Kb (or 16,0 Kb “on disk”). It contains 4 subdirectories and 97 tiny files (mostly .log files). As it was explained in one of the comments on this page that this has more to do with Mega.co.nz creating a container file there than Chrome itself. So if no Mega.co.nz use, no magic n GB file either. This is clearly bad software design but another very important question is around whether or not this means that Chrome is writing to the disk more than other applications. The lives of SSD drives are diminished by applications that are eager to write to your disk so forcing your application to stay in RAM would be a good thing. Unfortunately, tweaks for this on Chrome would be tough as Chrome already is very RAM hungry in order to isolate processes (see lifehacker’s “Why Chrome Uses So Much Freaking RAM” for some background). Firefox has a few tricks for this: Martin has covered running Firefox cache in RAM, though for security reasons rather than reducing SSD writes https://www.ghacks.net/2007/12/14/use-a-ramdisk-to-increase-firefox-security/ and Lifehacker gave a way to do it without a separate RAM disk http://lifehacker.com/5687850/speed-up-firefox-by-moving-your-cache-to-ram-no-ram-disk-required . If anyone is interested, the path on Ubuntu (and probably other GNU/Linux systems) for Google Chrome (as opposed to Chromium) is “~/.config/google-chrome/Default/File System”. I would assume Chromium would use a similar path. 8.65Gb and the culprit was Mega.co.nz. Good to be aware of, thanks. I didn’t know what could’ve had this much. it should also be noted that in the most recent versions of Chrome (I am using v60+ right now), using Chrome’s own ‘clear browsing data’ does not clear the file system or local storage. you have to manually go into settings>content>cookies to remove anything stored there. You can delete files manually but the counter doesn’t reset. Or go to Mega and download any file, you click in the 3 horizontal lines in the top right, then click in ‘Reload’, a message telling you that your browser cache will be cleared, say ‘yes’ to the question, and all files are removed. I had the same problem. I tracked down the 2 big files (2.5gig each) located in Chrome’s folder. One was under Shockwave, and the other under some other folder. I deleted both, sshut down chrome, reopened it with previous tabs. Everything is working fine and I’m close to 5 gig of freed space. It’s 2019 and this is still the best article on this topic. 5 gb reclaimed! echo Emergency Cleanup! You’re Hoarding!